Although combined ART is effective at preventing and reversing HIVAN, long-term use of such therapy has been linked to increased risk for focal segmental glomerulosclerosis, arterionephrosclerosis, and diabetic nephropathy. Guidelines recommending earlier initiation of ART may further reduce the incidence of HIVAN, but the overall risk-benefit for kidney health is unclear. For other discussions on management of HIV infection, see HIV Disease, Pediatric HIV Infection, and Antiretroviral Therapy for HIV Infection. The cellular target in the development of HIVAN is probably the renal glomerular and tubular epithelium. Using in situ hybridization and polymerase chain reaction assays to detect HIV-1 DNA and messenger ribonucleic acid (mRNA), investigators have shown that renal glomerular and tubular epithelial cells are productively infected by HIV-1 in patients with HIVAN; this argues strongly for localized replication of HIV-1 in the kidney and for the existence of a renal viral reservoir. Further, circularized viral DNA, a marker of recent nuclear import of full-length, reverse-transcribed RNA, has been detected in kidney biopsy samples from patients with HIVAN, suggesting active replication in renal tissue. However, the mechanisms of virus-induced renal injury remain undetermined. Peculiar histopathologic features of HIVAN are the enhanced proliferation and the loss of differentiation markers of glomerular epithelial cells. In one study, HIV-1 infection was shown to kill renal tubular epithelial cells in vitro by triggering an apoptotic pathway involving caspase activation and Fas up-regulation, suggesting that apoptosis of nonlymphoid cells can be directly induced by HIV-1. The net and long-standing glomerular and tubular epithelial cell damage leads to proteinuria, glomerulosclerosis, and tubulointerstitial scarring. The role of cytokines has not been established, and although their presence is not essential for the development of HIVAN, cytokines may modify the progression of infection or a patient's susceptibility to infection. The levels of cytokines are increased in renal biopsy samples from patients with HIVAN. In one study, mesangial and tubular cell production of interleukin-6 and tumor necrosis factor–alpha was shown to be a potent stimulus for HIV-1 expression in HIV-1–infected monocytes. Viral replication in response to cytokines may play an important role in the pathogenesis of HIVAN. Patients with HIV-associated nephropathy (HIVAN) typically present with a nephrotic syndrome consisting of nephrotic-range proteinuria (>3.5 g/d), azotemia, hypoalbuminemia, and hyperlipidemia. Edema is uncommon in HIVAN, yet many authors describe it as a characteristic of HIVAN. The salt-losing propensity and high oncotic pressure contributed by marked hypergammaglobulinemia in these patients have been suggested as possible explanations for this puzzling observation. Patients with HIVAN are not typically hypertensive, even in the face of renal insufficiency, and their kidneys are usually normal to large in size and highly echogenic on ultrasonograms, as well as on CT scans. This may result from prominent interstitial expansion by cellular infiltrate and markedly dilated tubules containing voluminous casts. Routine urinalysis may occasionally reveal findings of nonnephrotic proteinuria in patients being evaluated for other medical conditions. The urinalysis reveals microhematuria, leukocytes, hyaline casts, and oval fat bodies, but no cellular casts. Serum complement levels are normal. Electrolyte abnormalities, such as hyponatremia and hyperkalemia, may be observed in patients with HIVAN and may reflect an increase in total body water (from nephrotic syndrome or syndrome of inappropriate secretion of antidiuretic hormone [SIADH]) or from hyporeninemic hypoaldosteronism, respectively. SIADH may result from concomitant pulmonary infection or from persistent nausea from medications or gastrointestinal disease. Hyporeninemic hypoaldosteronism, a cause of type IV renal tubular acidosis manifesting as hyperkalemia with normal anion gap metabolic acidosis, is much more common when renal insufficiency is present. The decision to obtain a biopsy sample is somewhat controversial in the general medical community. Even if a patient presents with the classic clinical features of HIV-associated neuropathy (HIVAN), clinical consideration is predictive of the biopsy diagnosis in only 55-60% of patients. Therefore, to distinguish HIVAN from other forms of renal disease (eg, immune complex glomerulonephritis, immunoglobulin-A nephropathy), patients who are seropositive for HIV require a renal biopsy. The typical practice is to obtain a renal biopsy specimen if the patient's daily protein excretion is greater than 1 g.
Findings from light microscopy of kidney biopsy tissue are diagnostic in most cases. The most common histologic light microscopy finding is a collapsing form of focal segmental glomerulosclerosis. The glomerular capillary tuft is collapsed (see the first image below) and may be segmentally or globally sclerosed. Visceral epithelial cells are hypertrophied and form a characteristic pseudocrescent in the Bowman space. Tubulointerstitial scarring, atrophy, and marked dilatation of the tubules (microcystic dilatations) are usually present (see the second image below). Light microscopy with trichrome staining showing the collapse of the glomerular tuft, with segmental glomerular and interstitial sclerosis (bluish staining). 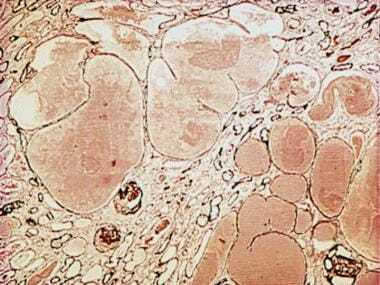 The renal tubules are dilated and filled with proteinaceous material. 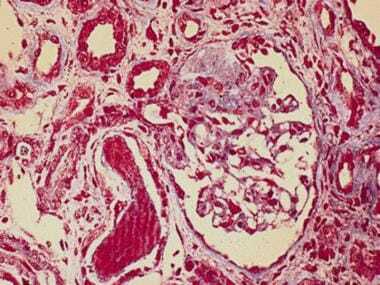 Light microscopy showing prominent microcystic dilatation of renal tubules filled with proteinaceous material; this finding is characteristic of human immunodeficiency virus (HIV)–associated nephropathy, although it may also be observed in chronic glomerulonephritis. Immunofluorescent microscopy helps to identify positive staining for albumin and immunoglobulin G in epithelial cells and for immunoglobulin M, C3, and, occasionally, A in mesangial or sclerotic areas. Electron microscopy reveals wrinkling of the basement membranes, epithelial cell proliferation, and focal foot process effacement. Tubuloreticular structures in the glomerular endothelial cells (consisting of ribonucleoprotein and membrane, the synthesis of which is stimulated by alpha interferon) is highly predictive of HIVAN (see the image below). 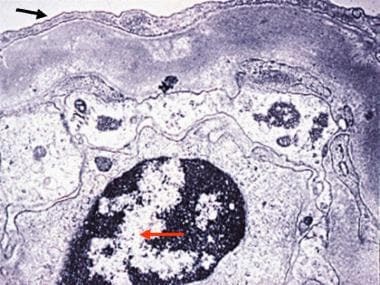 Electron microscopy showing a segment of the glomerular basement membrane; foot process effacement (black arrow) and prominent tubuloreticular inclusions (red arrow) are present. Most HIV medications are well tolerated, even in the presence of renal insufficiency. The (potential) toxicity of the nucleoside reverse transcriptase inhibitors (NRTIs—ie, zidovudine,  didanosine, zalcitabine, stavudine, lamivudine, abacavir, emtricitabine) uniformly manifests as type-B lactic acidosis. However, didanosine may cause electrolyte abnormalities, such as hypokalemia, hyponatremia, hypermagnesemia, and hyperuricemia, and stavudine may cause hyperuricemia. Tenofovir disoproxil fumarate (tenofovir DF) is an NRTI with the potential for cumulative renal toxicity.3 Dose adjustment is indicated when creatinine clearance is less than 50 mL/min. Except for nevirapine, which may cause lactic acidosis, the non-nucleoside reverse transcriptase inhibitors (ie, nevirapine, delavirdine, efavirenz, etravirine) have no reported significant renal toxicity. Enfuvirtide (Fuzeon) is the first of a newer class of fusion inhibitors that targets the gp41 protein on the surface of HIV and stops the virus from entering cells. Enfuvirtide has no known renal effects for creatinine clearance of greater than 35 mL/min. Maraviroc (Selzentry) is also a fusion inhibitor. It blocks the CCR5 coreceptor on CD4+ cells, preventing the virus from entering. Maraviroc does not require dose adjustment for creatinine clearance greater than 50 mL/min. Raltegravir (Isentress) is the first of a newer class of integrase strand transfer inhibitors. It does not require dose adjustment in patients with abnormal renal function. Dose adjustment should be made in patients receiving NRTIs when the glomerular filtration rate falls below 50 mL/min. Patients receiving nonnucleoside reverse transcriptase inhibitors (NNRTIs) may also receive a dose adjustment when the glomerular filtration rate falls below 50 mL/min. No dose adjustment is required for patients taking protease inhibitors. 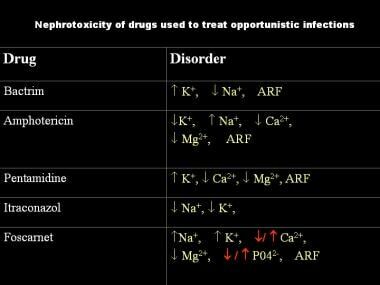 Some drugs used to treat opportunistic infections in HIV disease may also cause nephrotoxicity or electrolyte abnormalities (see the image below). Types of electrolyte abnormalities observed with some of the drugs used to treat opportunistic infections in patients with human immunodeficiency virus (HIV). ARF stands for acute renal failure. Although there are no guiding clinical studies, some experts recommend consideration of therapy in all patients with HIV-associated nephropathy (HIVAN). Initiation or adjustment of antiretroviral therapy may be indicated. See Antiretroviral Therapy for HIV Infection for specific information, including recommendations for dosage adjustments for renal insufficiency. Angiotensin-converting enzyme (ACE) inhibitors and corticosteroids have been studied for use in HIVAN. Some reports on pediatric populations suggest that cyclosporine can be effective in reducing proteinuria in persons with HIVAN. The usefulness of cyclosporine therapy for HIVAN warrants further study. Researchers are pursuing several promising therapeutic strategies. Patients who progress to end-stage renal disease (ESRD) require dialysis and consideration of renal transplantation in carefully selected cases. The exact mechanism of action of ACE inhibitors in HIVAN is unknown, but it may be related to a hemodynamic effect, a reduction in the transglomerular passage of serum proteins, and an antiproliferative effect mediated in part by the inhibition of transforming growth factor beta. Use ACE inhibitors if patients do not have hyperkalemia. A number of case reports have suggested that corticosteroids offer some short-term benefit in HIVAN. In one report, results from a pretreatment and posttreatment kidney biopsy suggested that an improvement in renal function was associated with a reduced number of lymphocytes and macrophages infiltrating the interstitium. In another report, of 20 patients who were treated with prednisone, 60 mg/day for 2-11 weeks, followed by a slow taper,  8 patients required maintenance dialysis, 11 died from complications, and 7 were alive and no longer had ESRD after a follow-up of 44 weeks. Although large studies demonstrate a clear benefit of organ transplantation for HIV-postive patients with ESRD, HIV-positive patients experience high rates of acute allograft rejection (AR). Wyatt CM. Kidney Disease and HIV Infection. Top Antivir Med. 2017 Feb/Mar. 25 (1):13-16. [Medline]. [Full Text]. Hou J, Nast CC. Changing concepts of HIV infection and renal disease. Curr Opin Nephrol Hypertens. 2018 May. 27 (3):144-152. [Medline]. Rosenberg AZ, Naicker S, Winkler CA, Kopp JB. HIV-associated nephropathies: epidemiology, pathology, mechanisms and treatment. Nat Rev Nephrol. 2015 Mar. 11 (3):150-60. [Medline]. Swanepoel CR, Atta MG, D'Agati VD, Estrella MM, Fogo AB, Naicker S, et al. Kidney disease in the setting of HIV infection: conclusions from a Kidney Disease: Improving Global Outcomes (KDIGO) Controversies Conference. Kidney Int. 2018 Mar. 93 (3):545-559. [Medline]. [Full Text]. Foy MC, Estrella MM, Lucas GM, Tahir F, Fine DM, Moore RD, et al. Comparison of Risk Factors and Outcomes in HIV Immune Complex Kidney Disease and HIV-Associated Nephropathy. Clin J Am Soc Nephrol. 2013 May 16. [Medline]. Bruggeman LA, Ross MD, Tanji N, et al. Renal epithelium is a previously unrecognized site of HIV-1 infection. J Am Soc Nephrol. 2000 Nov. 11(11):2079-87. [Medline]. [Full Text]. O'Donnell MP, Chao CC, Gekker G, Modi KS, Kasiske BL, Keane WF. Renal cell cytokine production stimulates HIV-1 expression in chronically HIV-1-infected monocytes. Kidney Int. 1998 Mar. 53(3):593-7. [Medline]. Kasembeli AN, Duarte R, Ramsay M, Mosiane P, Dickens C, Dix-Peek T, et al. APOL1 Risk Variants Are Strongly Associated with HIV-Associated Nephropathy in Black South Africans. J Am Soc Nephrol. 2015 Nov. 26 (11):2882-90. [Medline]. [Full Text]. Cooper A, Ilboudo H, Alibu VP, Ravel S, Enyaru J, Weir W, et al. APOL1 renal risk variants have contrasting resistance and susceptibility associations with African trypanosomiasis. Elife. 2017 May 24. 6:[Medline]. [Full Text]. Diana NE, Naicker S. Update on current management of chronic kidney disease in patients with HIV infection. Int J Nephrol Renovasc Dis. 2016. 9:223-234. [Medline]. [Full Text]. Abraham AG, Althoff KN, Jing Y, et al. End-stage renal disease among HIV-infected adults in North America. Clin Infect Dis. 2015 Mar 15. 60 (6):941-9. [Medline]. [Full Text]. Locke JE, Gustafson S, Mehta S, Reed RD, Shelton B, MacLennan PA, et al. Survival Benefit of Kidney Transplantation in HIV-infected Patients. Ann Surg. 2017 Mar. 265 (3):604-608. [Medline]. [Full Text]. Matavele Chissumba R, Silva-Barbosa SD, Augusto Â, Maueia C, Mabunda N, Gudo ES Jr, et al. CD4(+)CD25(High) Treg cells in HIV/HTLV co-infected patients with neuropathy: high expression of Alpha4 integrin and lower expression of Foxp3 transcription factor. BMC Immunol. 2015 Sep 2. 16:52. [Medline]. Chan KT, Papeta N, Martino J, et al. Accelerated development of collapsing glomerulopathy in mice congenic for the HIVAN1 locus. Kidney Int. 2009 Feb. 75(4):366-72. [Medline]. Pillay P, Wadley AL, Cherry CL, Karstaedt AS, Kamerman PR. Pharmacological treatment of painful HIV-associated sensory neuropathy. S Afr Med J. 2015 Sep 14. 105 (9):769-72. [Medline]. Ifudu O, Rao TK, Tan CC, et al. Zidovudine is beneficial in human immunodeficiency virus associated nephropathy. Am J Nephrol. 1995. 15(3):217-21. [Medline]. Rockwood N, Mandalia S, Bower M, Gazzard B, Nelson M. Ritonavir-boosted atazanavir exposure is associated with an increased rate of renal stones compared with efavirenz, ritonavir-boosted lopinavir and ritonavir-boosted darunavir. AIDS. 2011 Aug 24. 25(13):1671-3. [Medline]. Kimmel PL, Mishkin GJ, Umana WO. Captopril and renal survival in patients with human immunodeficiency virus nephropathy. Am J Kidney Dis. 1996 Aug. 28(2):202-8. [Medline]. Wei A, Burns GC, Williams BA. Long-term renal survival in HIV-associated nephropathy with angiotensin-converting enzyme inhibition. Kidney Int. 2003 Oct. 64(4):1462-71. [Medline]. Eustace JA, Nuermberger E, Choi M, et al. Cohort study of the treatment of severe HIV-associated nephropathy with corticosteroids. Kidney Int. 2000 Sep. 58(3):1253-60. [Medline]. [Full Text]. Smith MC, Austen JL, Carey JT, et al. Prednisone improves renal function and proteinuria in human immunodeficiency virus-associated nephropathy. Am J Med. 1996 Jul. 101(1):41-8. [Medline]. Sawinski D, Murphy B. End-stage renal disease and kidney transplant in HIV-infected patients. Semin Nephrol. 2008 Nov. 28(6):581-4. [Medline]. Roland ME, Barin B, Huprikar S, Murphy B, Hanto DW, Blumberg E, et al. Survival in HIV-positive transplant recipients compared with transplant candidates and with HIV-negative controls. AIDS. 2016 Jan 28. 30 (3):435-44. [Medline]. [Full Text]. Locke JE, Mehta S, Sawinski D, Gustafson S, Shelton BA, Reed RD, et al. Access to Kidney Transplantation among HIV-Infected Waitlist Candidates. Clin J Am Soc Nephrol. 2017 Mar 7. 12 (3):467-475. [Medline]. [Full Text]. Durand CM, Segev D, Sugarman J. Realizing HOPE: The Ethics of Organ Transplantation From HIV-Positive Donors. Ann Intern Med. 2016 Jul 19. 165 (2):138-42. [Medline]. [Full Text].